AFTER THE SMOKE cleared and the debris was swept aside, Second String Music Happy Hour legend Pete Magliocco emerged victorious Saturday to win the coveted and now broken Bedford Beer Can Bowling Invitational. But there was huge controversy, and we may have to call the International Beer Can Bowling Association of Nebo to clear it up. I was one of the first to bowl Saturday, as the chaos of our annual Saturday Before Thanksgiving Party started to unfold. The rules are this - you get three throws at 10 cans. They are reset after every throw. One point per can. You get one bonus point for every throw if you hold a beverage, so your max score is 33. I believe I notched a 28. Then Pete walked in and we handed him Angus' plastic moon ball, the official ball of Beer Can Bowling. Pete tossed his first throw. Immediately, Beer Can Bowling Sgt. At Arms Adam Yates cried foul, er, foot foul. Pete's left foot crossed the line as he threw, and his score of six cans plus bonus beverage held was not valid. I felt sorry for Pete and ruled he could replace his throw without penalty. What a dumb move. Pete proceeded to knock down seven pins on his replacement throw, one more than the previous throw. Then he bowled two beer can strikes and the store went nuts. There were protests filed and legal action was threatened, but in the end his score of 30 was allowed to stand. As it turned out, another guy threw a 29 so I wouldn't have won anyway. Plus I was having too much fun jamming and was in full store party mode. When Pete's name was announced, he immediately teared up and emotionally accepted the coveted trophy, made by Steve Rees' father. Then Pete broke the trophy. "I just came off!" he cried, pointing to the bowler dude on the ground. "I didn't do anything!" No worries, Pete. We'll get Steve to fix it this afternoon, or bring it to his dad to fix. Anyway, the store party was another raging success. To me, the best part is looking over at five or six people in the jam session playing music - none of them really know each other, but it doesn't matter. Music is the universal language. 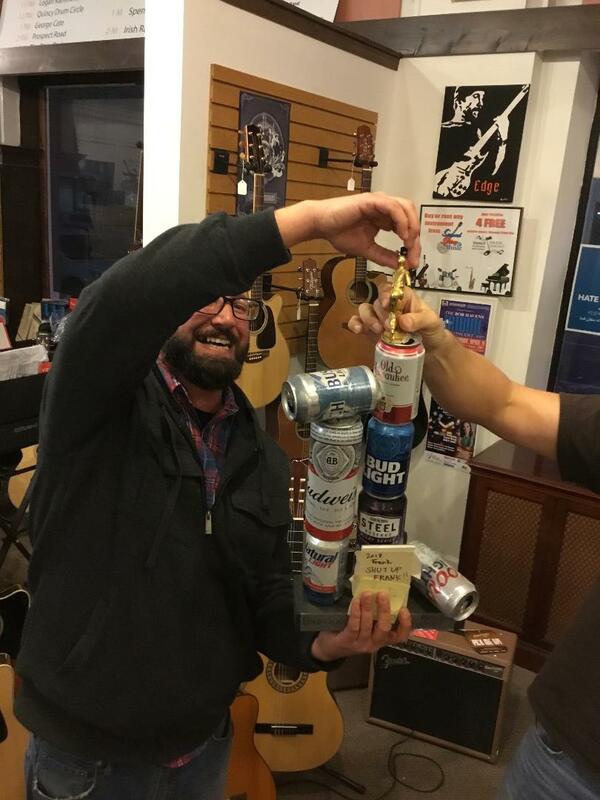 Until the next store party, our eighth anniversary in February, Pete is the reigning and defending Beer Can Bowling champ. Even if his name has an asterisks next to it.